Is There an Average Travel Trailer Height? 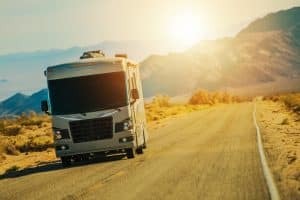 What States Can You Ride in a Travel Trailer or Fifth-Wheel? Tow Vehicles: Should You Buy New or Shop Used? What Vehicles Make the Perfect Toad? As the exclusive partner for Coleman RVs, Camping World is proud to offer all of their products to the market. Coleman offers a number of different variations of travel trailers that fit into two basic categories: Lantern travel trailers and Light travel trailers. There’s further delineation between the Lantern product series. You have the standard Lantern and then you have the Lantern LT. Today, we’re going to focus on the standard Lantern models. There are several different floor plans, amenities, and options to choose from. Here are a few of our favorite models for the 2019 model year. Measuring nearly 33 feet long with one large slide out, the Lantern 286RK offers tons of space for the whole family. This model features a rear kitchen layout. It also has both a large sofa and two swivel recliners, making it great for entertaining guests or getting the whole family together. The Coleman Lanter 215BH is a fantastic camper for a family that doesn’t want to deal with slides. It offers a queen bed near the front of the coach and bunk beds back by the rear next to the bathroom. One unique feature of the 215BH is that it also has an outdoor kitchen, complete with a sink basin and refrigerator. This is great for campers who love to have a cookout and don’t want a bunch of people traipsing through the interior of their rig. Perfect for a couple, the Lantern 202RD features a simple and smart layout. The rear-placed, camp-side dinette sits right across from a jackknife sofa, which means it’s easy for a couple to invite some friends over and there’s plenty of places to sit despite the camper’s relatively small size. Another great bunkhouse option is the Lantern 285BH. This camper features a single large slide out and two entry doors, allowing for multiple people to easily move in and out as well as through the floorplan. It has a queen bed up front and bunk beds and a bathroom in the rear. This model also comes with an outdoor kitchen in addition to the indoor one complete with a refrigerator and wash basin. It’s a great option for a busy family that loves the outdoors. If none of these options from Coleman tickle your fancy, then you should consider browsing their other models. Have a floorplan you like? Leave a comment below. THE MOST AMAZING EXPERIENCE I HAVE EVER HAD!!! We are first time camper owners!! I cannot express how knowledgeable, friendly, and classy staff on board is that made our purchase from start to finish amazing! Even after our purchase our trust in staff is definitely appreciated! We highly recommend anyone and will express the excitement we still have even after our purchase! Thank you Camping World of Anthony! We love you all!! want to THANK Newman for all his help today while in your facility. He was very knowledgeable, helpful and very courteous. we haven’t decided to pull the trigger just yet – but for sure he will get our sale. definitely made our shopping experience pleasurable. What a fun experience we had with sales rep Cindy! All staff was friendly, full of knowledge on all make and models of the campers camp world offers. If your a first time camper would recommend you visit Camp world due to the trust and appreciation you receive from the staff! Thank you Camp World!